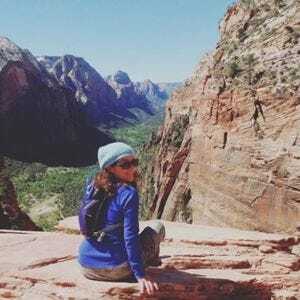 The extravagance and allure of Orlando’s many luxurious resort properties notwithstanding, most of the traveling public takes its vacations on a budget. Fortunately, world-class destinations like the City Beautiful offer myriad options for those looking to spend a little less on their accommodations so they can spend a little more exploring the Magic Kingdom, the Wizarding World of Harry Potter and the dozens of other attractions that make our city something of a travel Mecca for families from all over the world. What’s especially nice is that giving up a star or two from a property’s name doesn’t have to mean sacrificing amenities or extras – not by a long shot. Cases in point: the Rosen Inn at Pointe Orlando isn’t merely across the street from of one of I-Drive’s most frequented destinations for dining, shopping and entertainment; it also has three swimming pools (two heated), a recently renovated arcade and free guest shuttles to Universal, SeaWorld and Wet ‘n’ Wild. Heck, you can even bring your dog. An expansive recreation area, including a pool and beach volleyball keep family vacationers active at the Avanti International Resort, even on off-park days. 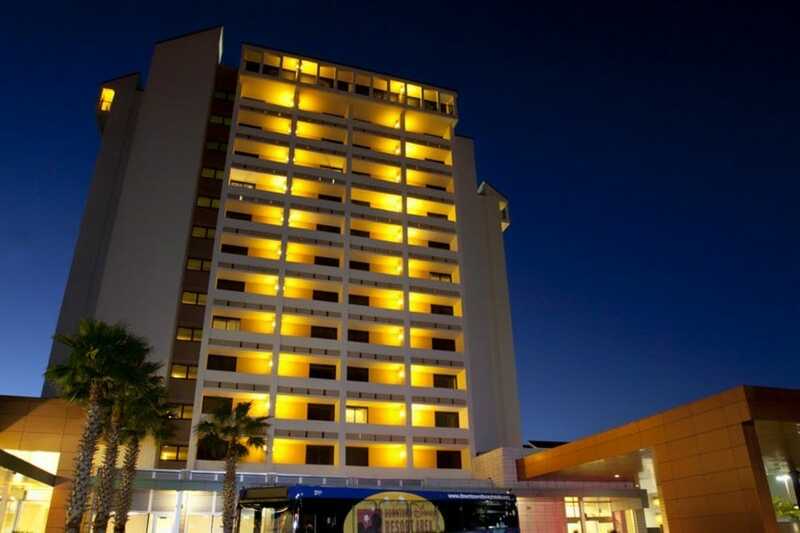 A convenient location puts guests within walking distance of restaurants, shops and other attractions. 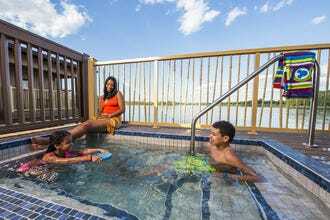 Families looking for a reasonable rate and a super convenient location will enjoy the Holiday Inn Orlando - Lake Buena Vista, where the ever-growing dining, shopping and entertainment options of fun and fabulous Disney Springs are a quick stroll from your door. Complimentary transport to all Disney parks (including water parks) means you may not even want to rent a car. 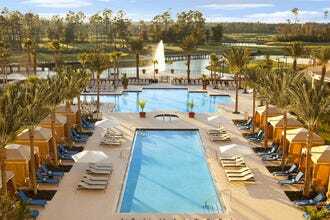 Guests also enjoy discounts at Disney's golf courses, an on-site Disney store and a heated, zero-entry pool for the days you just want to kick back and enjoy the Orlando weather. Kids 12 and under eat free with adult purchase. 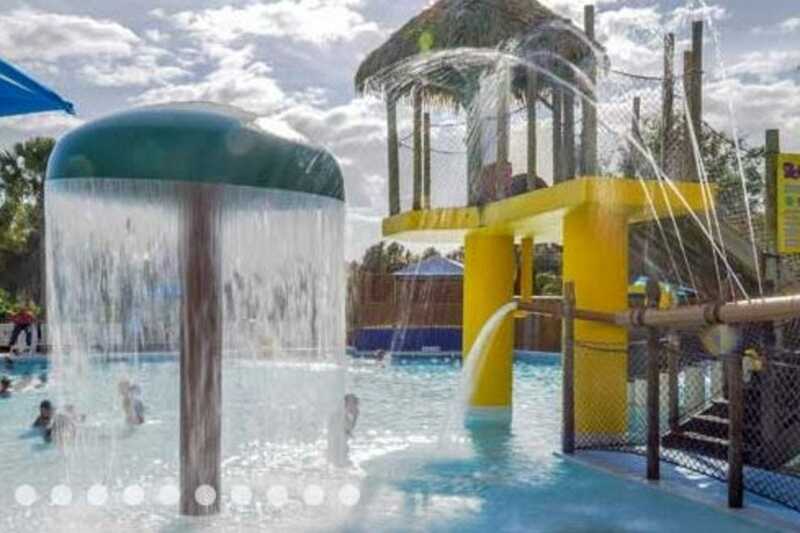 Liki Tiki Village, with its ample amenities including two pools and a water-scape play area your kids will die for, is a resort experience on a budget. You'll often find rooms here (and by rooms, we mean 1- to 3-bedroom condos with full kitchens) for under $100/night. Stay in and cook: save more. Opt out of housekeeping: save more. 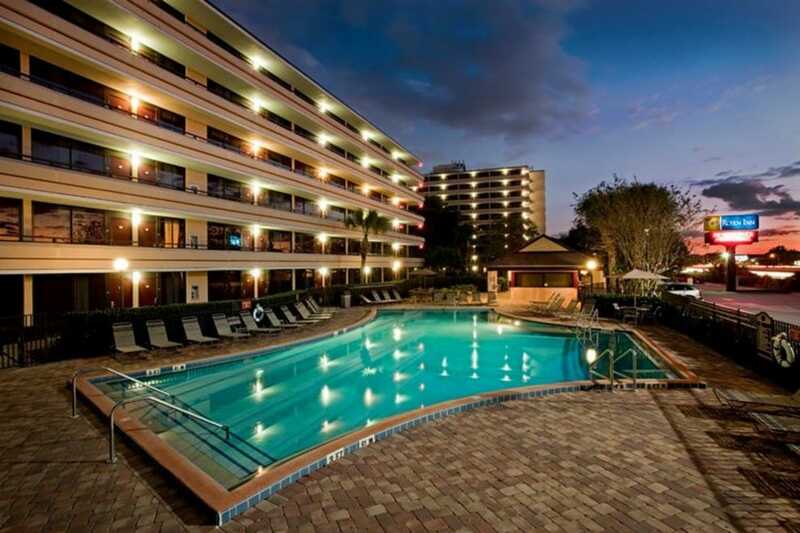 Most amenities are free and ample and Disney, Universal, SeaWorld and all manner of shopping is just minutes away. Definitely best for families with children; this place is lively with lots to keep them busy if you're taking a break from spending at the parks. 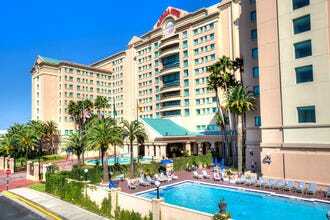 The 640-room Clarion Inn Lake Buena Vista –" with its two swimming pools and colorful "Splash Zone" –" is an exceptionally family-friendly choice, making intermittent breaks from park-hopping not only relaxing for the grown-ups, but fun for the kids. Rooms feature either two doubles or one king bed, along with fridge, microwave, coffee maker, cable TV and free wireless Internet. Of course, when the time comes to head back to Orlando's signature attractions, the hotel's free scheduled shuttle service and advance ticketing make it easy. The on-site Boardwalk Buffet Restaurant offers a "Kid's Eat Free" program is available for children under 9 who are dining with a paying adult. Free is this property's middle name –" free hot "Quickstart" breakfast, free "5:30 Kickback" with hot food and cold drinks, free soda and popcorn in the lobby. Sure, Drury offers other freebies, like wireless Internet, but with so many free eats available, you may not even have room for the area's many fine restaurants. You'll have space to swim them off, though, in the hotel's neat indoor/outdoor swimming pool, which means random Florida rains need not send you scrambling for your room. 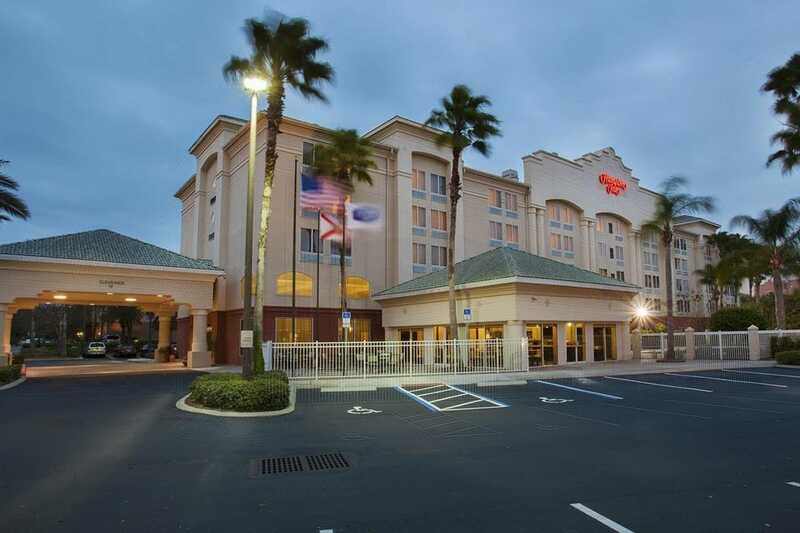 Nearby, attractions like SeaWorld, Aquatica, and the range of Disney's theme parks –" not to mention the near round-the-clock excitement of Universal Orlando –" delight vacationers, but the Drury Inn & Suites Orlando is convenient for business travelers, as well. You want value? You got it. And just one block from everything that I-Drive has to offer. 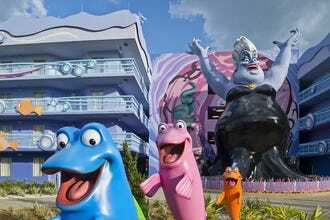 Free guest shuttles run daily to Wet 'n'Wild, Universal, SeaWorld and Walt Disney World theme parks, and since this property is all-suite, your party will have some room to move in their home away from home. An outdoor pool, spa and fitness center are all on site and a nightly Manager's Reception helps put a reasonable spring in your step before you head out for a scintillating evening on the town. Complimentary wi-fi means you'll have all the access you need to fill your days and nights with vacation excitement on the fly. Yes, this property is uber-convenient for Universal Orlando Resort-centric vacations, but it's also the closest property to the Holy Land Experience if you're in the market to visit. Guests will enjoy free scheduled transportation to SeaWorld, Universal and Wet 'n' Wild and the daily, free full breakfast will have them loaded with plenty of energy for a full day of theme parking. Don't want to wait for the shuttle? For Universal-goers, there's no need. 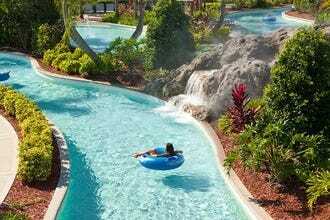 This property makes visits to CityWalk, Islands of Adventure or Universal Studios Florida a walk-to breeze. And in Orlando's mostly glorious weather, you'll want to take advantage. 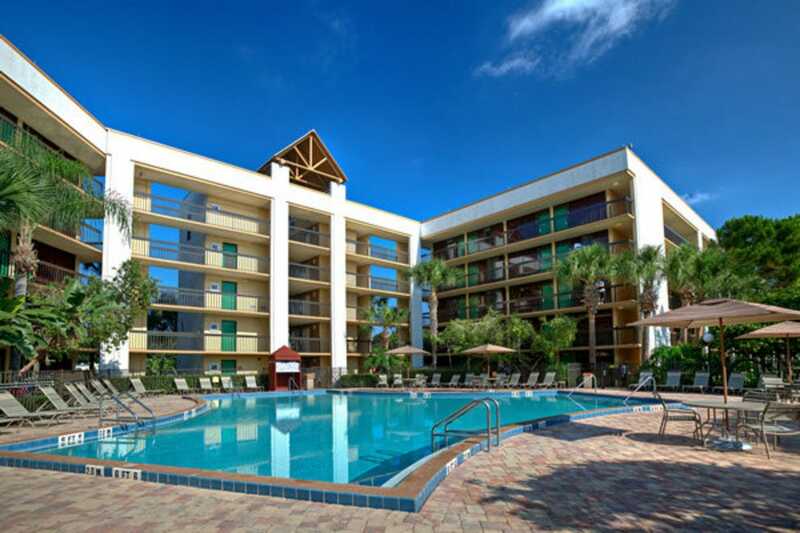 This property sits in the heart of Lake Buena Vista, just minutes from Disney's doorstep, and the complimentary shuttle service makes getting there –" or SeaWorld, Discovery Cove, Universal Islands of Adventure, even one of Orlando's Premium Outlet Malls –" super convenient. 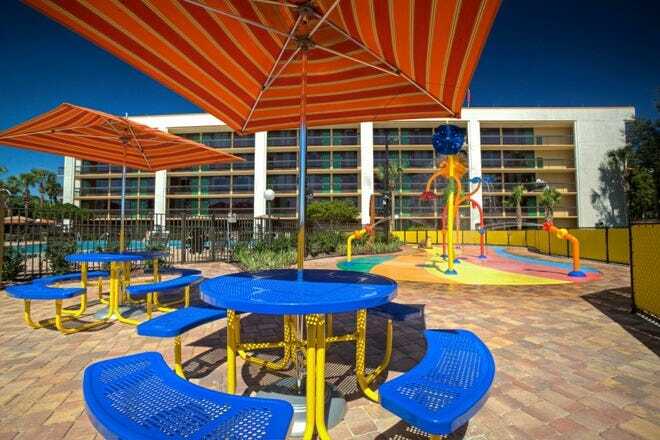 In fact, you can even purchase Disney tickets right in the hotel lobby while the family enjoys a free hot breakfast. 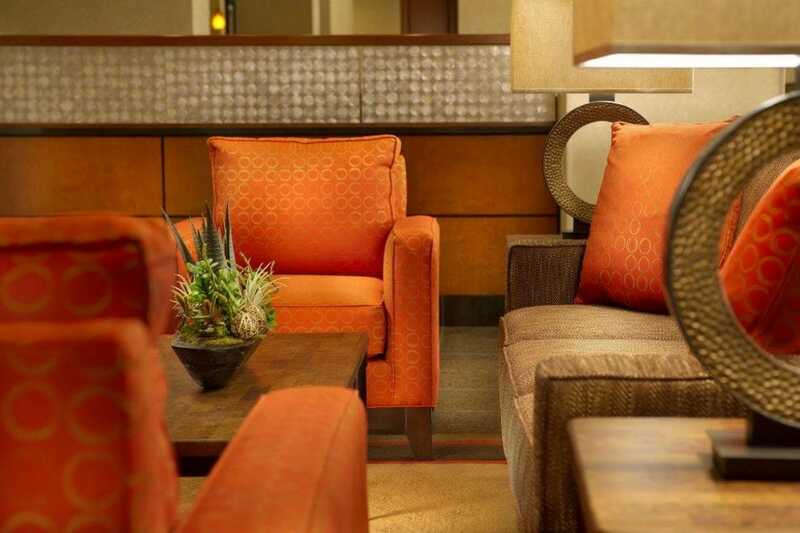 Other complimentary amenities include high-speed Internet access in every room and use of the gym and fitness center. Business travelers can split the difference between work and play while enjoying the convenience of the on-site center –" fax, photocopying and printer are among its amenities. Avanti's expansive recreation area means active families will find favor in staying put on those off-park days. 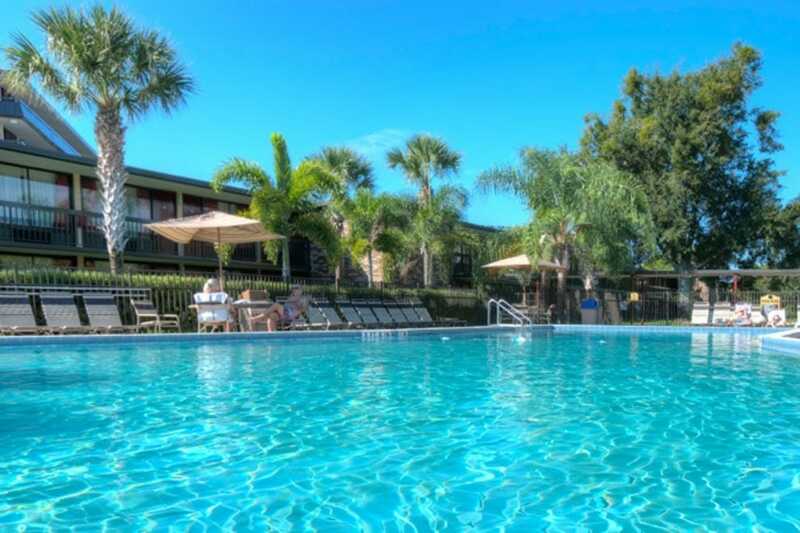 Those looking to relax can grab a frosty beverage at the poolside cafe, and those with energy to burn can swim, play beach volleyball or even enjoy the on-site fitness center. Scheduled shuttles to and from the theme parks means you can either leave the car (or skip the rental altogether) and the property's location is walking distance from an array of shops and eateries. Every Friday from 3:00 to 6:00 p.m., local artists show off their creative talents in the Avanti Lobby. 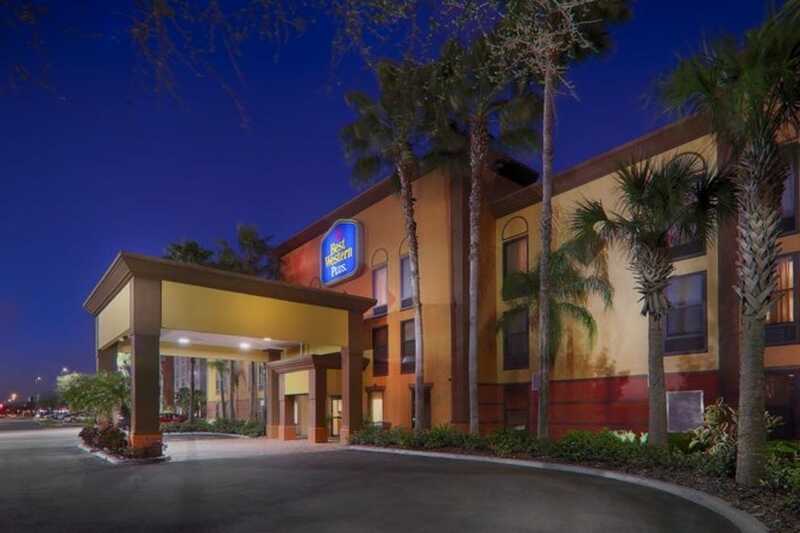 Located on International Drive, the Rosen Inn at Pointe Orlando offers easy access to theme parks, restaurants, shops and movie theaters. Complimentary shuttle services are offered to an array of theme park attractions, as well as the Rosen Shingle Creek Golf Course. 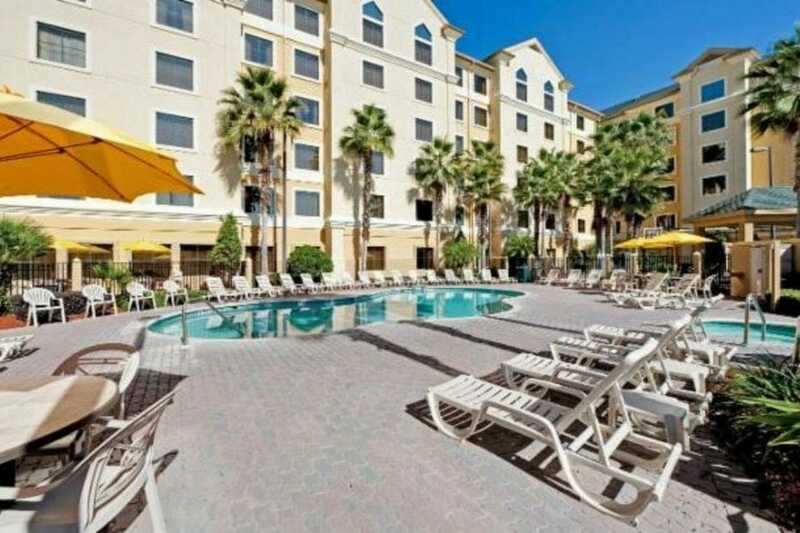 The 1,020 rooms at the Rosen Inn at Pointe Orlando provide standard amenities like a high-speed Internet access, mini fridge, microwave, coffeemaker, alarm clock, hair dryer and 32-inch television. Late-night snackers will find the Little-Bite Mini-Market and Deli's 24-7 hours an especially nice convenience. 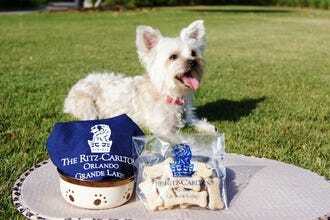 Travelers with pets will be happy to know Fido can tag along, as well, for a small, additional fee. 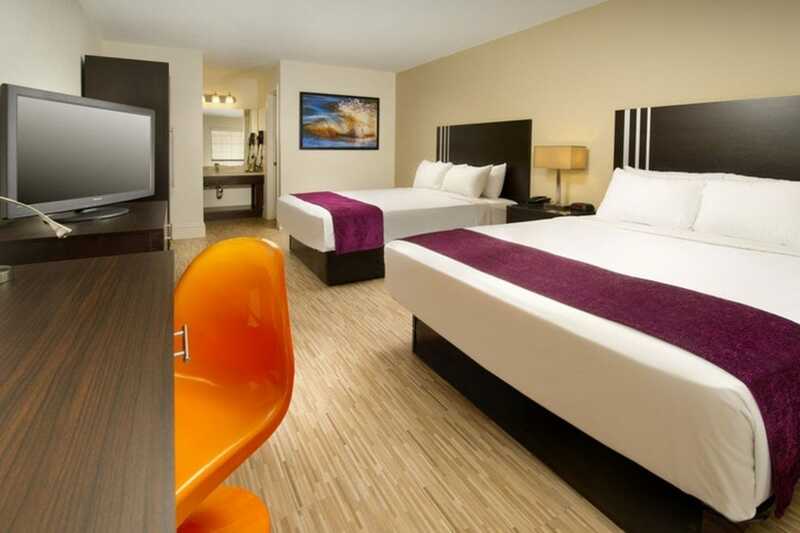 Not only does this value-centric property offer a lush, tropical setting just minutes from the excitement of Universal and the entertainment, dining and shopping of I-Drive, kids ages 9 and under will dine free at the buffet with a paying adult. That's savings you can easily apply at any number of the city's wonderful venues. Of course, there are on-site amusements here, as well, including two outdoor heated pools, a playground and a video arcade. Lounge lizards will find nightly drink specials and all the sports they want on the bar's multiple TVs and karaoke to entertain would-be American Idols.